01:04 Warren Buffet: Thank you. Thank you. 01:11 WB: I think you made it pretty clear who you’ve come to hear, so I’ll… In just a minute, I’m going to talk about my favorite subject, which is going to be what Hillary can and will do in the eight years following January 20th. 01:44 WB: But before that, there have been a couple of things said by Donald Trump in the last few weeks that I’ve… Wait ’till you hear them, then you’ll really boo. I’d like to clarify a little bit. And these are important points that he’s made, and it’s important that you hear the answer on them. The first point was when he was asked about revealing his income tax returns, which every presidential candidate has done for 40 years. He said, “None of your business,” which did not go over so well. And then he started giving various explanations. And one of the explanations was that he had given his financial statement to the Election Commission that listed his assets and liabilities, but believe me, as someone who’s filled out financial statements and someone who has filled out an income tax return, I can tell you, they are two very different animals. 03:04 WB: You will learn a whole lot more about Donald Trump, if he produces those income tax returns. And so, that’s why I’d like to make him an offer. An offer I hope he can’t refuse. 03:26 WB: Donald Trump, at one point… He says various things at different times, but at one point, and he said it several times, he said he can’t do it, can’t release it because he’s under audit. Now, I’ve got news for him. I’m under audit, too. And I would be delighted to meet him anyplace, anytime, between now and election, I will bring my tax return, he can bring his tax return, nobody’s going to arrest us. It is not… There are no rules against showing your tax returns, and just let people ask us questions about the items that are on there. 04:19 WB: How many of you would be afraid to have your tax return made public? No. 04:31 WB: You’re only afraid if you’ve got something to be afraid about. 04:45 WB: And he’s not afraid because of what? Of the IRS. He’s afraid because of you. 05:00 WB: So I will meet him in Omaha, or MiraLago, or he can pick the place, anytime between now and election. I’ll bring my return, he’ll bring his return, we’re both under audit, and believe me, nobody’s gonna stop us from talking about what’s on those returns. And send the word to him, if you will. 06:00 WB: Well, la-di-da, you know what I mean? He says, only he can fix it. 06:17 WB: I didn’t really realize we were in such grave danger. I mean, there’s 325 million Americans, and if this guy leaves for Canada, it’s supposed to be hopeless for the rest of us. Although he alone can fix it. It takes some kind of nerve, or something else, to really have the notion that out of 325 million people, you’re the only ones that can fix it. Now, I think when someone makes a statement like that, you should look at his record when he has appealed to the American public before. Now, Donald Trump has been in a lot of businesses, he’s had a lot of bankruptcies. But usually, that’s just involved borrowing money from the American public. But in 1995, to my knowledge it’s the only time, Donald Trump went to the American people and he said, “Join me, I’m a winner. Join me and invest in my company. Trump Hotels and Casino Resorts.” It’s the only time he asked the public. But now, you got a chance to join the great man in this investment. That was in 1995. They listed on the New York Stock Exchange and Mr Trump, very modestly, made the ticker symbol DJT. Guess what that’s for. So he names the company after himself. He gets the ticker symbol after himself. The next 10 years, the company loses money every year, every single year. He takes out $44 million in compensation during that period. In 1995, when he offered this company, if a monkey had thrown a dart at the stock page, the monkey on average would have made 150%. 08:03 WB: But the people that believed in him, that listened to his siren song, came away losing well over 90 cents on the dollar. They got back less than a dime. And you know the history of his enterprises, where he was borrowing money. Well, one time after another, he went into bankruptcy. I’ve really never known another businessman that brags about his bankruptcies. 12:07 WB: And I add, I just add one thing. McCarthy’s career went straight downhill after that. 12:28 WB: Let’s move on to more pleasant subjects. Unlike what Mr. Trump says, America is great. 12:58 WB: Let’s talk about the USA, ’cause 240 years ago, we started with a piece of paper. It was a blueprint for a new society, a society unlike anything the world has ever seen before. 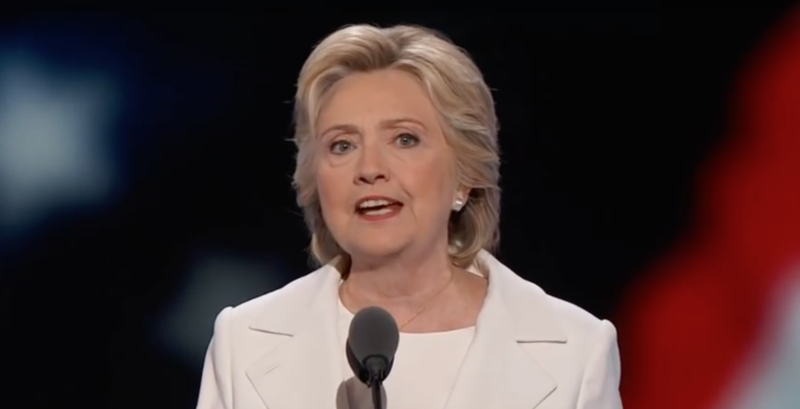 And in 1776, that blueprint started us on a path that has finally led to the next woman president. It is imperfect. 13:30 WB: But it is aspirational. Now, that blueprint has done wonders for this country in terms of overall prosperity. When I was born in 1930, if my parents had seen what the world would look like in 2016, they wouldn’t have believed it. The GDP per capita is six times what it was when I was born. That’s never happened in the history of mankind. It’s a miracle. And the miracle, the miracle is America and it still has all the qualities that it had in 1930, and which propelled us forward like this. So America in terms of delivering wealth has been incredible. In terms of distributing wealth, it has not been living up to, what I consider it’s potential. 15:21 WB: Let me give you just one more statistic, and I’ll get away from that, but I know how popular that is. But in the first year of the Forbes 400 back in the 1980s, the aggregate wealth of the 400 was 93 billion. You can look at up on the internet. Currently, it’s $2,374,000,000,000. That’s 25 for one. Now, I’d like, everybody that’s had 25 for one themselves, if they’d raise their hand. It hasn’t happened. They told us it would trickle down. But what has happened… What has happened is that it’s flooded upward, and that almost 2.4 trillion from 400 people in this country, they’re not bad people. I know a good many of them. I’d like to know more, actually. 16:58 WB: It’s going to take that somebody to affect change. There’s no question about it. It won’t happen by itself. It takes guts. It is a tough, tough job when you’re trying to change the code on people who are making millions and millions of dollars a year in order to give a better break to the people who work just as hard, maybe harder, and take home a few hundred dollars a week. It’s really wrong that in a country where $56,000 of GDP per person for anybody that works 40 hours a week, not to be able to provide a decent living for their family. It just doesn’t make any sense. 17:57 WB: And it won’t cure itself. And it certainly won’t be cured with Donald Trump. It’s going to take Hillary Clinton, it’s going to take powers of persuasion, it’s going to take a mandate from the people in her election, but she’s spelling out like she’s going to do as contrasted to the other candidates. She is telling you what she is going to do about the tax code. And when that gets enacted, I’ll be a little worse off, and believe me I can take it. And you’ll be better off. 18:39 WB: I’d like to make a little news, and this a surprise even to Hillary. It’s very easy, there were 129 million votes cast in the last presidential election. It’s very easy to think if you’re watching a TV show or the weather is a little bad or something to think, “Well, my vote really doesn’t count, what difference it could make with 129 million?” Well, I’ve got some real news for you. It doesn’t make much difference if you’re a Democrat in Idaho or a Republican in California, you are in the state where the electoral vote is gonna be decided by majority vote. And you’re on the short side in that case. But we live in a very special place. 21:00 WB: I am looking at the people that can change that 269 to 270. 21:21 WB: It happened in 2008. By 3200, or 3325 votes, by… We actually gave a vote separate than the rest of Nebraska. So it’s been done, it’s been done. 21:35 WB: But we’re gonna help that process along this time. I have pledged today that on election day, November 8th, I will take at least ten people to the polls who would otherwise have difficulty getting there. 23:50 WB: Let’s give America a civics lesson, how about it? Everybody in the second district, yeah? 23:58 WB: And if the people in this room, if each one of you would pledge to take 10 people, I can almost guarantee, that will be the march to the victory. So, join me, if you can take 20 do that, if you can only take three or four, that’s fine, too. But get that neighbor who you know is watching that television program, who feels it’s a little cold, and shame them, and they’re coming with you to the polls. Now, just remember, Drive2Vote, okay. 24:37 WB: Now, if you’ve read the Constitution, which apparently, some people haven’t. 24:45 WB: If you read Article Two, it deals with the presidency. Article Two of the constitution, look it up. That’s where they described the presidency. We wrote that constitution, 39 men signed it. How would you ever guess? You’ll find out in a minute. 39 men signed it, and in Article Two, describing the qualifications for the President of the United States, male pronouns ‘he,’ ‘his,’ and ‘him’ were used 20 times. Just imagine that, and that’s still in the Constitution 227 years later. He, his, and him. No hers, no shes. Well, on January 20th, we’re going to elect the best president we’ve ever had, and somebody’s gonna change those pronouns. We’ve just started an exciting new blog series in which we’ll be transcribing numerous major speeches from top political and influential public figures. This will include presidential speeches, debates, major press conferences and much more. As one of the top transcription services in the industry, we are in a unique position to ensure this information is publicly available. Without any biased commentary, we provide the full transcript so you understand the complete context of what was said. And with all of our transcriptions, we maintain a 98% accuracy guarantee. We believe this is important because many of today’s leading websites no longer offer the full transcript, instead, opting for out-of-context pull quotes which often change the original message. Scribie does not endorse or condone a position regarding any political candidate, group, or cause. These transcripts are intended solely as a resource in aiding the flow of unadulterated information. We hope you enjoy this series as much as we enjoyed transcribing it. Please reach out to us at support@scribie.com if you have any request for speeches to transcribe.